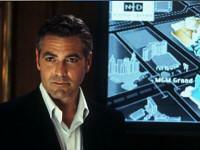 Overview - Ocean’s 11 (2001) Danny Ocean (George Clooney) likes taking chances. All he asks is that his handpicked squad of ten grifters and cons play the game like they have nothing to lose. If all goes right, the payoff will be a fat $150 million. They’re back. And then some. Twelve is the new eleven when Danny Ocean and pals return in a sequel to the cool caper that saw them pull off a $150 million heist. But $150 million doesn’t go as far as it used to. It’s time to pull off another stunner of a plan. Exciting locations include Amsterdam, Paris and Rome, the direction of Steven Soderbergh again and the original cast plus Catherine Zeta Jones and others. Danny Ocean rounds up the boys for the most dazzling heist yet, after casino owner Willy Bank (Al Pacino) double-crosses one of the eleven, Reuben Tishkoff (Elliott Gould). George Clooney, Brad Pitt, Matt Damon and more reteam with director Steven Soderbergh for a split-second caper that stacks the deck with wit, style and cool. 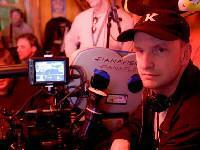 When 'Ocean's Eleven' hit theaters in 2001, it seemed that indie mastermind Steven Soderbergh could do no wrong. Having risen through the ranks making intelligent films that challenged audiences, impressed critics, and garnered the respect of his industry peers, even a pulpy heist flick like 'Ocean's Eleven' stood out from the crowd, receiving rave reviews and grossing more than $450 million worldwide. Alas, it would be Soderbergh's last indisputable hit. In 2002, the director turned his attention to a series of more experimental projects that disappointed many who had previously praised him. Even the more mainstream sequels to 'Ocean's Eleven' were met with chilly receptions -- 'Ocean's Twelve' was critically crucified, while 'Ocean's Thirteen' was pegged as more of the same. Thankfully, I'm one of the lucky heist flick junkies who couldn't care less about critical consensus. There's nothing like watching sure-handed, quick-witted anti-heroes develop and execute an unimaginably elaborate heist. Sure, the sequels never reached the heights of 'Ocean's Eleven,' but in my opinion that's only because Soderbergh set an insurmountably high bar his first time around. I'd even argue that the low points of the series are more impressive than the majority of other heist flicks. For that reason, I'm exceedingly pleased that Warner Brothers has continued to support the series with the release of the 'Ocean's Trilogy' on HD DVD and Blu-ray. 'Ocean's Eleven' kicks things off with a bang by introducing Danny Ocean (George Clooney), a criminal mastermind whose unshakably cool demeanor masks a staggering intellect. When he's released from prison, he sets about trying to exact revenge on his nemesis, casino owner Terry Benedict (Andy Garcia). After assembling a group of the best thieves in the business (played by Brad Pitt, Matt Damon, Carl Reiner, Don Cheadle, Bernie Mac, Scott Caan, and Casey Affleck), Ocean devises a plan to win back his ex (Julia Roberts) while simultaneously robbing three of Benedict's most profitable casinos. Easily the strongest of the trilogy, 'Ocean's Eleven' also happens to be one of my favorite films of all time. Ted Griffin's light footed screenplay is rife with stylish dialogue that the cast members deliver with sharp tongues and cool wit. The script is supported by Soderbergh's breezy direction and effortless editing, all of which combine for a thrilling final act that balances sleight of hand with humor to deliver a truly satisfying end to the tale. The climactic heist is both epic and entertaining -- a stunning finale that's as mesmerizing today as it was the first time I saw it. 'Ocean's Twelve' (released in 2004) takes the team out of Vegas and sets them loose in Paris, Amsterdam, and Rome. Three years after the triple-casino robbery, a vengeful Benedict tracks down the crew and forces them to earn back the stolen loot (plus interest). Doing what they do best, the team focuses on a series of intricate heists to reach their fundraising goals. But it won't be so easy this time, as they have to contend with a rival thief (Vincent Cassel), a feisty agent of the law (Catherine Zeta-Jones), and a reluctant new team member. That being said, there's still a lot to enjoy in 'Ocean's Twelve,' and in my opinion it isn't nearly as bad as many critics have made it out to be. Brad Pitt and Matt Damon sink their teeth into more centralized roles, but their clever banter with Clooney is as kinetic as ever. Better still, a series of larger-than-life opponents toy with each criminal and give the team a genuine challenge. To top it all off, the thieves actually struggle with the difficulties of their lifestyle and have to face the consequences of their actions. The endgame may not be as strong as the vault robbery in 'Ocean's Eleven,' but Soderbergh still has plenty of aces up his sleeve. For 'Ocean's Thirteen' (2007), Soderbergh again reunites our favorite thieves to take down a vicious casino owner named Willy Banks (Al Pacino). But rather than physically harm Banks, Ocean decides to hit him where it really hurts -- the potential cash flow of his new multi-million dollar hotel and casino. The cast members comfortably sink back into their roles, while Pacino's villain ignites the story, with the actor given free reign to dominate the screen and play up every line. His Willy Banks is a cold-blooded Vegas old-schooler, played with ferocity and bubbling rage. 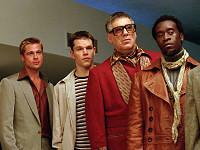 'Ocean's Thirteen' may not top the first film, but it's a definite improvement over 'Ocean's Twelve,' managing to effectively return the focus to the place where this series belongs -- Vegas. This time around, the heist is more satisfying, the plot points have more weight, and the actors are less self-referential. There are even moments of heart and genuine pathos that manage to elevate the significance of 'Ocean's Thirteen,' making it more than just a piece of regurgitated entertainment. That's not to say that this sequel is as good as it could be. Whereas 'Ocean's Eleven' balanced the mechanics of its heist with a series of carefully plotted character dynamics, 'Oceans Thirteen' makes the heist the main focus of the story, giving the entire film the feel of an extended third act that's consumed by the details of the robbery rather than the development of the film's characters. As a result, the end product lacks some of the wonder and pure exhilaration of the first film. I'll be the first to admit that the Ocean's trilogy isn't perfect. While 'Ocean's Eleven' is a true genre classic, Soderbergh's sequels visibly struggle to rekindle its fire. Still, clever characters and witty dialogue are the real draw here, and on that level the series is quite consistent. Likewise, even watching all three films in succession, it remains a joy to watch this crew of first-rate actors clearly having a ball with their performances. If you can turn off the overly critical portion of your brain, here's betting you'll find plenty of things to love scattered across these three fabulously funny and engaging films. 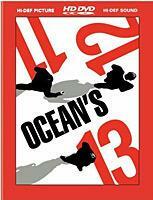 The 'Ocean's Eleven, Twelve & Thirteen Giftset' arrives on HD DVD in a slipcovered box set that houses individually packaged copies of all three films. While it may be a bit bulky for some, I personally prefer having a standard case and cover for each movie in a series (rather than a single multi-disc case). Warner presents each of the three films in this high-def box set with matching 1080p/VC-1 transfers, but the similarities between the three discs pretty much end there. In fact, taken as a whole, the wildly different visual experiences on display in the 'Ocean's Trilogy' would seem to demonstrate everything that's both exciting and perplexing about Soderbergh's down-and-dirty asthetic. Even though it's the oldest of the three, 'Ocean's Eleven' easily boasts the most technically impressive video transfer of the bunch. The palette subtly changes throughout the film, but colors remain sturdy throughout, offering natural skintones and vibrant primaries. Detail is also exceptionally sharp -- clothing textures, individual strands of hair, and even the tiniest text on casino chips are crisp and lovingly rendered on screen. The entire image has a natural pop that makes the Vegas casinos look warm and inviting. Likewise, daytime exteriors offer excellent contrast, while nighttime interiors simmer with deep black levels. I did catch a few small bursts of artifacting, but I likely would have missed each instance if I hadn't specifically been looking for it. In fact, the only real nitpick I have with the picture quality of 'Ocean's Eleven' is that quick pinpoints of white randomly flick on the print throughout the film. Still, compared to the muddy standard DVD, this HD DVD edition is an absolute godsend. Fans will be extremely pleased to see how great 'Ocean's Eleven' looks in high definition. On the opposite end of the spectrum, 'Ocean's Twelve' offers the worst transfer in the trilogy. While it occasionally maintains the bright contrast of 'Ocean's Eleven,' the crisp detailing and image depth of the first film is nowhere to found. Instead, Soderbergh intentionally submerges 'Twelve' in heavy, crushed shadows that strip faces and locations of the type of pop common to the best high definition releases. Noise is also much more aggressive this time around -- in some scenes I actually had trouble telling whether I was seeing heavy grain, digital noise, or some other sort of technical deficiency. Although I'm certain this transfer reflects Soderbergh's directorial intentions, taken purely on the level of high-def eye candy, it's hard not to label this one a disappointment. 'Ocean's Thirteen' is also something less than a high-def demo disc, this time due to Soderbergh's use of glaring color discrepancies and a monsoon of heavy noise. For the majority of the film, skintones are boosted, oversaturated, and flooded with deep orange tones (even more than I remember seeing in theaters). Likewise, spiking grain and low lighting make detail a moot point at times. Although sharpness and clarity receive an impressive upgrade compared to the standard-def DVD, they make the grain sharper than the rest of the imagery, resulting in a salt and pepper fiasco that's so elevated at times that the picture can be almost entirely flat and two-dimensional. To be fair, despite the strange choices made by its director, this high-def transfer of 'Ocean's Thirteen' does have technical merit. Crowds and pinpoints of light are crisply rendered in long shots of the casino. Black levels are deep, and contrast suits the film nicely. Some shots are even downright gorgeous -- when Soderbergh reduces his fixation on orange, the picture comes alive and looks wonderful while still retaining the director's naturalistic rejection of Hollywood shooting styles. In these moments, blues and greens really pop, while textural detail of the sets and costumes often look great. Unlike the varied quality of the video transfers, the audio packages on each of the 'Ocean's' films share the same peaks and valleys. Once again Warner delivers matching specs, with all three discs boasting a Dolby Digital Plus 5.1 surround mix at 640 kbps. Although I'm slightly disappointed that Warner Brothers hasn't included any high-res audio options, I doubt the upgrade would have done much for the subdued soundscape of the trilogy. Each of the films are dialogue driven affairs where light quips dominate the central channels and push the bulk of the soundfield forward. The conversations are always crisp and well prioritized, and I never had to strain to hear the characters speak (except for two intentionally hushed lines in 'Ocean's Twelve'). But the most exciting element of these audio tracks is the jazzy score of each film. Every last note of the improv-laden music dances through the soundscape. Saxophones have a satisfying growl, trumpets pack a stable punch, and the riz-at-dat of the drums sound more clear than they did on any of the standard DVDs. Unfortunately, the audio mixes rarely take advantage of the rear surrounds -- the busy casinos in 'Ocean's Eleven' and 'Thirteen' provide the same technical experience as the crowded streets in 'Ocean's Twelve.' Ambiance is relegated to the bottom of the soundscape and very little attention seems to have been invested in the immersive properties of the tracks. Add to that a series of underwhelming dynamics (with a minimal LFE presence to boot) and there really isn't a standout audio track in the trilogy. Make no mistake, each of these mixes handle everything Soderbergh gives them with ease, but overall they fail to pack the kind of sonic wow factor of better high-def releases on either format. In what's sure to be a relief for completists, Warner has ported over every last special feature from the standard DVD versions of the three individual films for this high-def box set. What's more, they've even thrown in a couple of significant high-def exclusives for 'Ocean's Twelve' and 'Ocean's Thirteen,' which I'll discuss in the next section. The first film features the most substantive and exciting supplemental package of the group, benefiting from the direct presence of some key cast members. The biggest disappointment is that Clooney is MIA from the proceedings. Cast Commentary -- Actors Brad Pitt, Matt Damon, and Andy Garcia sit down to deliver a hilarious chat that covers every aspect of the production. I loved listening to their anecdotes and playful barbs. Pitt is a riot, tapping into his trademark deadpan charm to provide joke after joke at the expense of his fellow cast and crew. Damon has a blast and provides a revealing glimpse into Soderbergh's directorial personality and style. Garcia feels like the old man of the group, but he mingles well enough. This is an excellent track that had me smiling from beginning to end. The Look of the Con (SD, 10 minutes) -- Costume featurettes generally don't catch my attention, but this one matches the tone and drive of the film itself. Quirky, candid, and entertaining, this segment actually gave me something new to look for next time I watch the film. Theatrical Trailers (SD, 5 minutes) -- A collection of theatrical teasers and full length trailers. Like the DVD, 'Ocean's Twelve' has no non-exclusive special features save a collection of trailers. Warner has ported over the complete set of supplements from the concurrently-released stand-alone versions of 'Ocean's Thirteen,' but alas, this is a rather anemic collection. An Opulent Illusion (SD, 23 minutes) -- Rather than focus on the film itself, this featurette explores the history of Las Vegas and its rise to financial prominence. It covers the psychology employed by casinos to increase gambling, the methods the casino owners use to lure in new tourists, and the careful assault of the senses that's used to draw more and more tourists to Nevada. The most surprising point in this mini-doc is that modern day Las Vegas isn't kept alive by gambling revenues, but rather by the shows and events that litter the hotels and casinos. All in all, a very good featurette, even if it's not directly related to the film. Deleted Scenes (HD, 5 minutes) -- This is an interesting collection of cuts, but I can see how they might have hurt the film more than they would have helped. Fans will likely enjoy a couple of the extra character riffs and the subtle change in the reveal of heist's inner workings. Jerry Weintraub Walk and Talk (SD, 2 minutes) -- In this all-too-brief featurette, the film's producer gives a tour of the Casino set used in the filming of 'Ocean's Thirteen,' which was certainly an amazing recreation of the Vegas asthetic. Bringing together all three films in Steven Soderbergh's Oceans trilogy, the 'Ocean's Eleven, Twelve & Thirteen Giftset' offers a trio of cool heist flicks anchored by a near-perfect opening volley of wit. Unfortunately, this HD DVD box set is a bit of a mixed bag, offering up a strange variety of video transfers, a series of subdued audio tracks, and a package of somewhat limited supplements. Die-hard fans of the trilogy will still want to pick this one up, but more casual admirers of the the first flick may want to wait until Warner eventually makes the first two films available for individual sale on HD DVD.